Is it A Shawl, A Skirt, A Wrap and A Scarf! 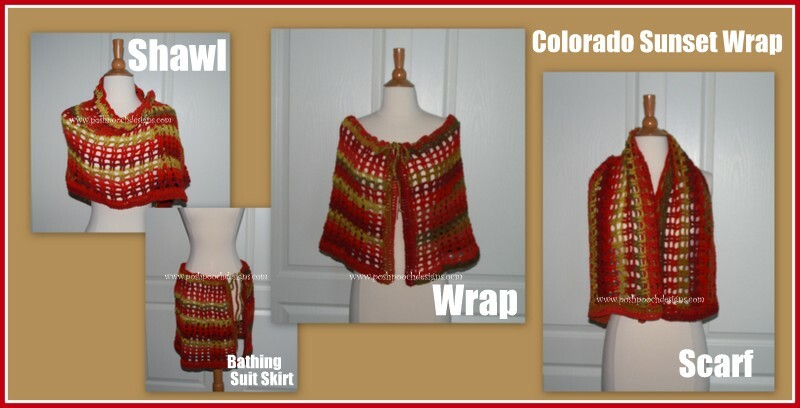 I Love Crochet Patterns that are versatile. And This one sure is! of the sunsets we get here in Colorado. the sun set over the Rocky Mountain pine trees. Yarn Needle for Working in the ends. Notes: ch3 at ends of rows counts as the 1st dc of the next row. If you want the Warp longer – Continue to repeat R : 5 until desired length. tie off when you reach the corner again. “See pic on next page”. With 2 strands of yarn Ch 230, put a knot on each end of the Ch. If you want the Drawstring long , just ch as many as needed. Tie off and Weave in your ends with the yarn needle. Red Heart would be awesome, also.